If you are a dog lover like me, you like to make comfy little spots for your pets to sleep. One of our labs sleeps peacefully on a bed in our room, but the other is a puppy and he would be running laps around the house and chewing everything up if we let him be on the loose at night. So, at night time, he goes into his crate. You know, those black wire ones that you can bring in your car, etc. Well, lets just say after a year I was tired of looking at the metal dog crate in our living room and decided to finally do something about it. 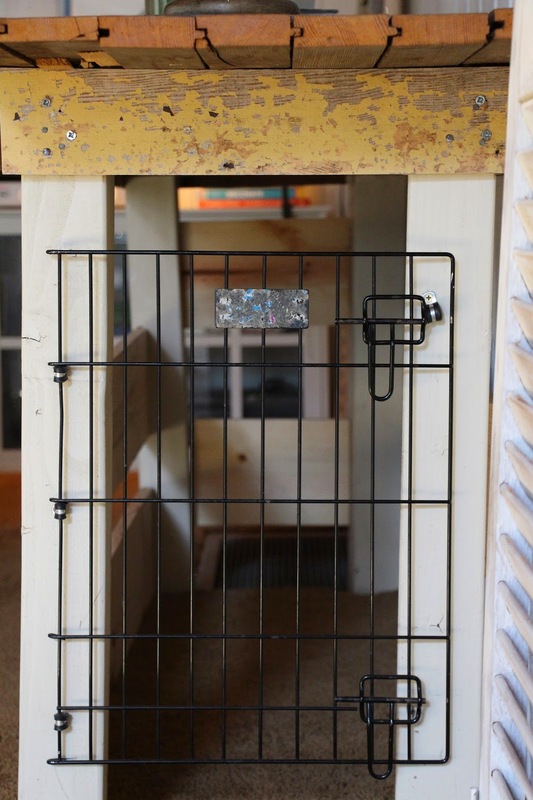 Here is how I turned our console table into a little dog kennel for the puppy. I removed the door from the wire crate and attached it to one end of the table. My husband rigged up a latch to keep it shut. Then, in order to avoid the back of our couch getting dirty, and also from Oakley sticking his tongue in the electrical outlet, I nailed up 1x8 pieces of pine on the other 3 sides. It's the perfect size for him and he loves it! and was able to use some strong adhesive glue to add it to the front. The best part, you would never even know it's there! I love functional practical ideas! 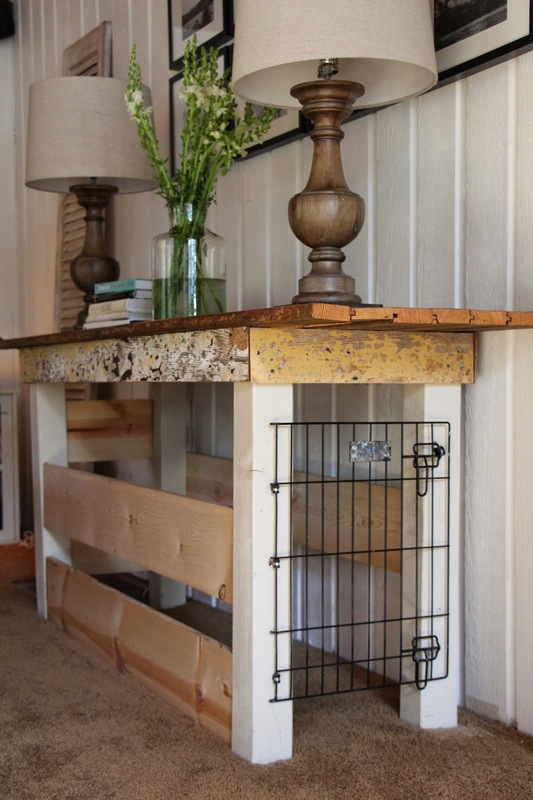 Did you build your console table? It is so gorgeous!! Unless you made him back into the crate, then he has room to turn around ;) I LOVE this idea!!!! Seems no matter what you do with your fur babies, someone is out there to tell you, you are doing it wrong :( My dog also loves to be somewhat enclosed and this would solve that problem for her. Brilliant! And you dog is adorable. Size is easy to calculate: tip of nose to tail + 6" for Length. Sitting tall measure top of head to floor + 6"
for Height and the same for Width. Crating is usually used only a short time for potty training. We also built one under a 2" wide table for our Yorkies. Ingenious idea...does look small given the puppy's size, however. Still love your creativity! I've been reading your blog for years. This idea is brilliant, love it. 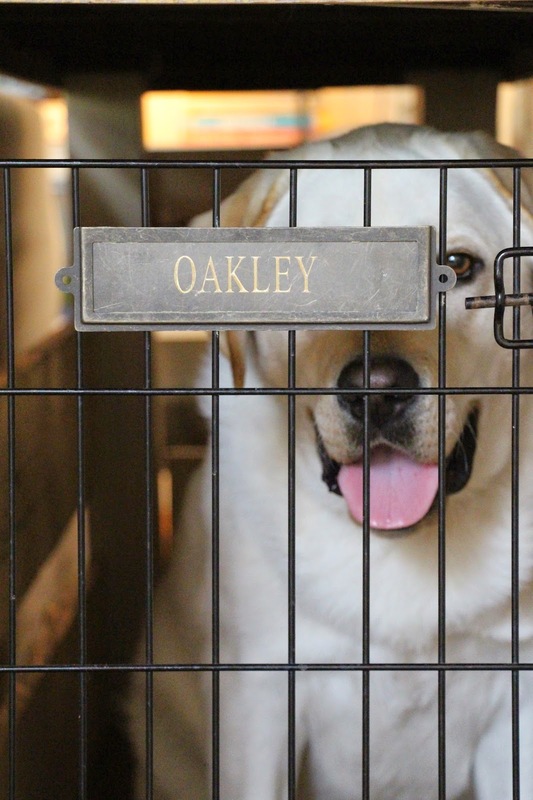 We have a yellow lab that we crated for potty training, etc. The darn thing was so ugly I couldn't wait to get it out of the house! I have no idea what size is appropriate for crating, honestly it would never cross my mind to second guess how you raise your dogs. What I DO know is that you are an avid dog lover and love your dogs like children. It's obvious you know how to properly raise your sweet pups, and wouldn't ever do anything to make your dogs even the slightest bit uncomfortable. It's unfortuante that "mom shaming" stretches to fur mamas too. Melaine I think you are amazing! You're creativity has inpired me to do so many things around my home. I check your blog almost daily and look forward to your posts. I think comments left on blogs like yours should be positive And light in nature. People need to Save the negative comments and criticism for the heavy stuff like politics, religion, and PETA. Melaine, I respect and love your blog, and all your ideas. I know how much you love your fur babies....I've followed your blog for years. It's sad that some people can't follow the golden rule "if you don't have something nice to say, please say nothing at all!" You're an inspiration to me, and always will be!!!! Give a Oakley a long scratching behind his ears for me! People choose zyrtec for their dogs because rarely causes sedation (hence its replacement for Benadryl). Only use zyrtec where cetirizine is the only active ingredient as some formulations use pseudoepehedrine which is dangerous for dogs. NEVER give “Zyrtec-D” to your dog.